Fake feng shui is fun feng shui. What? Does it surprise you that I would say that? Its true...! It is more fun to make feng shui seem magical and mystical, full of tradition and mystery. That isn't really the case though, feng shui actually does work and it isn't nearly as new-agey mystical, magical as some would have you believe. Any way here are some of my favorites, if you have fallen victim to these at one time or another don't sweat it!!! How do you think I figured out they were as phony as a three dollar bill in the first place? Trial and error. These are common myths or wives tales associated with feng shui, which also include many Western theories of which I have found no merit to. If you find your self following some of these not to worry, you may like the idea of a wealth vase. That is fine. As long as you realize it is not going to change your wealth status, but it will make you smile, go ahead and keep it. 1. Lucky bamboo. If bamboo were so lucky don't you think the Chinese would earn better wages? OK but seriously, there is more luck in bamboo than there is for the rabbit that lost his foot! 2. Your south wall is your fame wall- paint it red!!! Yikes- seriously if you had done this in 2008 when the yellow number five annual star was there and this was a room you spent much time in, troubles were bound to find you. This is the equivalent of asking the universe for the toughest year possible. 3. Sleeping on money. This is awesome. Awesomely stupid. The spirit of stupid surrounds this. I recently heard of an elderly lady in New York who had fallen ill, her loving children got her a new bed. One of those fancy adjustable one to help her. Of course they threw out the mattress that she had been sleeping on for twenty years- right along with the $30,000. stuffed in it! Seriously, keep your savings in a fire-proof safe if they are at home. - I am not even going to put a number her because this is supposed to be worse than 13!!! In Chinese the number four sounds like death!!!! AAAHHH! True they are spelled the same however, the accent or emphasis is different, so we think it is unlucky- go figure. 5. Mandarin ducks, pairs of doves, love birds and the like help create long loving relationships in your house, including marriages. Only if no one knocks them over, breaks them accidentally and dusts them on a regular basis- really this is ridiculous. If anything this is only creating clutter and feng shui is not a fan of clutter. 6. Oranges bring wealth. Um NO! but they do protect one against scurvy. 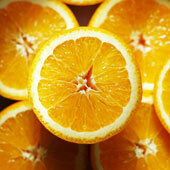 Oranges are often eaten after a meal in Asia because of their sweetness, I don't know how we got wealth from that. 7. Indoor plumbing is supposedly the demise of all the wealth in feng shui. I don't know about you but I love indoor plumbing. The only thing you lose in flushing the toilet-well, you don't want it any way, right? Good- enough said. 8. One of my all time favorites are mirrors repel sha-chi. So you have this bad chi and you want to point it right back to your neighbor-too bad for them. This is funny and ineffective at the same time. 9. Enhance your wealth corner- with mirrors. What a great way to double your income. The only way I have found to double my money is to fold it over and put it back in my pocket. I bet it works for you too! 10. Paint your front door, back door, side door RED if it faces south, again I recall the annual number Five is here every nine years, just give it an invitation to really wreak havoc on your life with this cure. 11. The cure all for money woes is the Chinese coins tied to a red ribbon. I think this does help the Chinese financially. After all, we have to buy the ribbon (they have to make this, they make everything else) and the Chinese coins are probably imported form where else but China!!! It does work - just not for you! 12. The good old money tree cure- mine died. How is yours working out for you? Nope this is another wives tale. 13. The red ribbon around the drain to stop prosperity from draining. The only thing draining is what you are trying to get rid of in the first place--- do you want to be prosperous in waste? Methinks not! 14. Gold fish in a tank. There is no truth to this no matter if you have eight gold fish or one. If one happens to die it only means you are not ready for bigger pets or children, yet. 15.Antiques harbor the energies of all kinds of bad things according to this tall-tale. The only thing a beautiful antique will do is set you back a chunk of change or increase your assets- depending on how you look at it. 16. What!?!? You have a TV in your bedroom, and you are still alive to talk about it? Naturally, because there is no harm in having a TV in your bedroom.This is especially true if you have a studio apartment- it beats having it in the bathroom. 17. The indoor wind-chime cure. This can actually attract ghosts- truly. So the only thing this may cure is loneliness or a good nights rest. No thanks. Not even at Halloween. 18. Bamboo flutes hanging from beams or displayed for cures. One more thing to dust as granny would say. So it cures idle hands? Maybe but it really has no value, unless you like them or collect them. 19. Books in the bedroom---Oh no! Tell that to all the college grads- I bet they didn't even know they were setting themselves up for imminent disaster- not success. 20. The king sized bed and the split box springs. First of all, it should be noted that if you have a king sized bed you may never sleep alone again if the word gets out. Second of all, this does not contribute to divorce, it does lead to a better rest and less chance of one being a bed-hog. 21. The wealth vase- filled with rice and valuables-- really? You don't just see this as worthless without an explanation? Just keep it then and let me know when you strike it rich. 22. The pile of rocks somewhere on your land to mimic a mountain..... to an ant!!! Really, this is lovely and useless. Maybe it is a row of rocks- you are still not off the hook. 23. Red ribbons on doors in door-ways, attached to door handles with bells. The bell method is a great alarm on the cheap. The others just tell your visitors, "I am weird!" 24. The death and decay of dried flowers, nope, they are not my fave but hey maybe you like them. If so keep them with no worries. The only thing they hold is dust. 25. Drive a car that matches your kua, it will support you. Only if you are a taxi driver and your element is earth in which case a yellow car is great!